(Cambridge, MA) If Massenet’s Cendrillon was a cake, it would be covered in thick, buttery frosting, have crushed sugar cookies inside, and funfetti melted into every layer. This version of Cinderella is one of the sentimental renditions of a wildly popular but very reliable recipe. As a fan of multiple versions of the rags-to-riches, wish-fulfillment fairy tale, which includes the much bleaker version explored in Into the Woods, I enjoyed the sweetness that the Harvard College Opera leans into so very hard in this production. The characters come in the forms of cyphers that one can slide into with little trouble. Arianna Paz is appropriately warm and charming as Lucette, a giving, hearty daughter to Pandolfe (Alexander Chen) and stepdaughter to the materialistic, cruel Madame de la Haltière (a thunderously fun and hilariously haughty Rebecca Thau). Madame sings of her hopes for love at first sight so that her dimwitted daughters (the hilarious Hagar Adam as Noémie and Ruva Chigwedere as Dorothée) will attract the attention of Le Prince Charmant (Samuel Rosner). Lucky for Madame, the confectionary world of the play doesn’t just have love at first sight, but true love at first sight! Her daughters, however, are not the heroines. Of course we see ourselves as Lucette, the put-upon Cinderella. She needs only to be very good and humbly do all of her work for her fairy godmother, La Fée (Natalie Chood), to turn up and reward her with a trip to the ball to meet the prince. The physical comedy makes the show shine brighter. Erin Aslami, Laura Coe, and Phoebe Suh are accomplished dancers with equal command of grace and humor. Similarly, the chorus brings personality and poise to the stage, whether they are put-upon servants or the regal, ethereal nymphs who accompany La Fée. The problem with this sort of material is the trap of taking it too seriously. Thankfully, most of our characters are able to sidestep that, adding a layer of comedy to a prince afflicted with the worst of all illnesses in this world—ennui! In my view, I wish the show had leaned further into the camp baked into its material, but that may be a better fit for Gioachino Rossini’s La Cenetentola, which predates this version of Cinderella by about a century. Cendrillon, which premiered in Paris in May of 1899 according to my intensive Wikipedia research, is more about embracing the unrealistic pieces of the fairy tale than pointing out its quirks. The grim forest scene in Act III stands out. The ball over and Lucette without her beautiful, blue fairytale dress (good use of costuming by Emily Murdock and Marta Pawluczuk), she realizes that the delight of meeting the prince is gone. Yes, they fell in true love at first sight, but how in the world can they be together if all they had was that evening? Grim shadows of trees dominate the stage as she sorrows. How could it be a French opera if we are not asked to contemplate despair? But fear not. Where an opera may end with tragedy, the comic operetta of Cendrillon barrels forward toward an escapist’s happy ending. Leave sadness and the dreary cold outside the theater. Here, like a cake fresh from the oven, it is all warmth and sweetness. 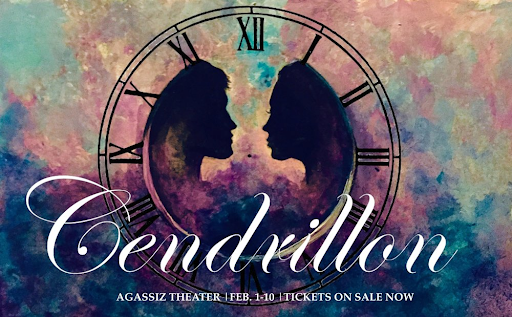 This entry was posted in Musicals and Opera, Opera and tagged 2019, Agassiz Theatre, Benjamin P. Wenzelberg, Cambridge, Cendrillon, February, Gillian Daniels, Into the Woods, Jules Massenet, MA, Madeline Snow, The Harvard College Opera by gilliandaniels. Bookmark the permalink.